As we are a few Django lovers in Lausanne we (Sylvain, Noé and I) spent a hackday exploring Mezzanine, a very light CMS layer on top of this nice Python framework. Of course this list is completely subjective but at least it gave us a pretty good start to evaluate Mezzanine. We were pretty happy with these initial results, even though having multiple languages is probably a must have for most of our clients. At this point we had two choices, either investigate the multi-language issue or install and make a dummy project using Mezzanine which would verify our assumptions. As we didn't have any experience with this CMS we chose the second one. 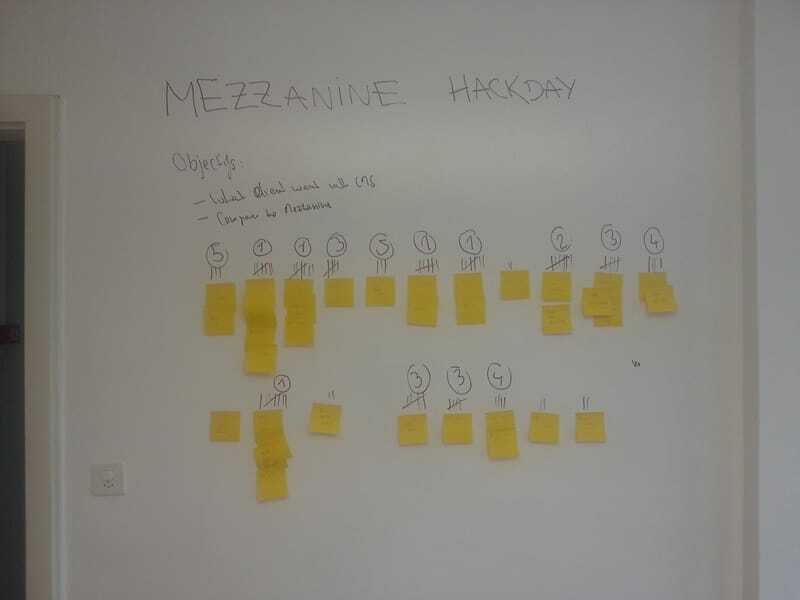 Creating custom content types in Mezzanine was really easy and we had activities and their related sessions in no time. The only thing is that we first wrongly assume we should extend the “Page” model before understanding that we didn't want Activities to be mixed together (ie. hierarchically organized) with the others pages, so we finally extended the “Displayable” behaviour. As Mezzanine “is just Django” creating relations between content types (activity/sessions) was a breeze and we could, on a single admin page, edit our activity and add multiple sessions. As a developer point of view it's a real pleasure to be able to define content types in code, as simple Django model, especially compared to let's say Drupal content type (…) It makes it also way easier to collaborate on a project and share (git/db migration). On top of that you get basic front-end editing: you just add a pre-defined template tag around your field and once logged in when browsing your site you see an “edit” button next to each rendered field! This is nowhere as powerful as what you can do with createjs for ex. but is a nice feature nevertheless. As the included category possibilities were not enough for what we wanted (no hierarchy) we installed django-categories (remember “it's just Django!”) and voila! we could organize our activities in a nice tree. Mezzanine, through a fork of django-filebrowser, provides a simple but effective image management solution. By default all content types images / wysiwyg images are uploaded in a shared directory (different sub-folders) which makes it easy to re-use images.Thumbnail creation is handled through a template tag, with the usual “create if doesn't exists, just use otherwise”. With the very limited time we still got we added a Teacher profile (one to one relationship to Django User) and role, so that we could easily add some permission checks. Again fairly straightforward. 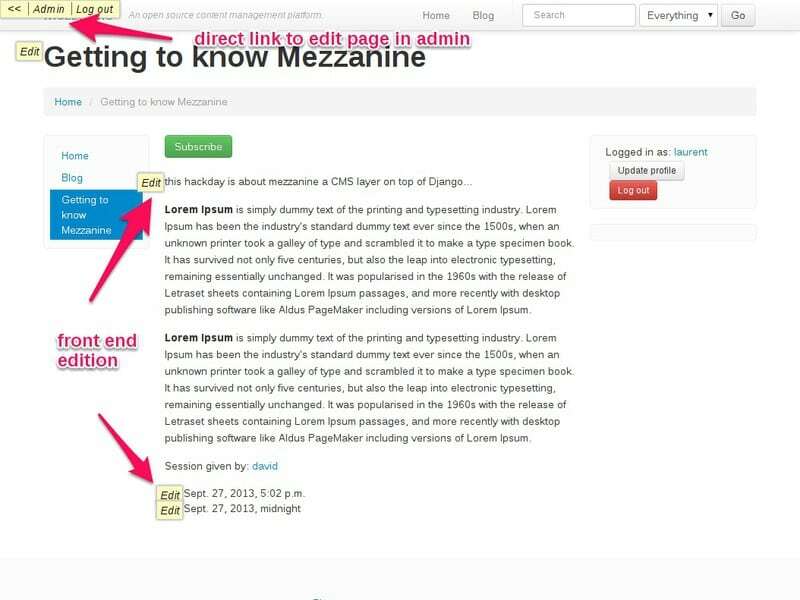 On the front-end side, Mezzanine uses Bootstrap by default, which gives a good starting point to layout content. The basic theme is easily extendable/overridable by simply creating new/extending existing templates. (For the Symfony2 lovers around, Twig was much inspired by Django templating system, so you'll feel at home). I personally had so much fun that i added student registration / subscription to activities on my spare time!